Group Visits at Rope Runners01277 364470work Group VisitsChallenge yourself on our new high ropes adventure courses - we have 5 courses on three levels plus a big zip wire, climbing wall and our 13 metre free fall fan descender. We use the revolutionary Klipa safety system to eliminate the risks associated with traditional cowstail systems which means we can cater for everyone aged 6 and over. 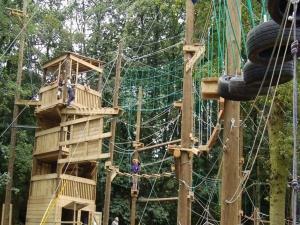 Challenge yourself on our new high ropes adventure courses - we have 5 courses on three levels plus a big zip wire, climbing wall and our 13 metre free fall fan descender. We use the revolutionary Klipa safety system to eliminate the risks associated with traditional cowstail systems which means we can cater for everyone aged 6 and over. From 1st March to 30th November we are open every day (except some Mondays) from 10.00 - 5.00 or 6.00 (depending on the time of year). Other days and evening sessions by arrangement. Birthday parties from £19 per head. The management reserve the right to limit participant activity to 2½ hours during busy periods. We will do our best to cater for disabled clients - please contact us to discuss before visiting.